This is a photo of my computer where I do all my work. 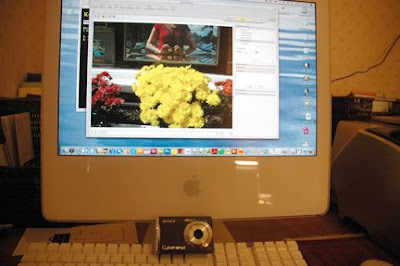 I often use my Nikon D70 to take photos but, I also use a Sony Cyber-shot (shown here). It great if I don't want to carry around the bigger camera or I am going somewhere that the big Nikon would be inconvenient. It has allowed me to take many more photos. The photo below is a new work. I took it on Newbury Street in Boston. I call it Giant Twins. It looks like they are much bigger than the brownstones and maybe, even take them over. This was taken with my little Sony.